Scopes up for the debut of OSOK Horde this Friday! This Friday, it’s time to welcome the ultimate Gears 4 OSOK event with the 4 new challenges, the return of Classic OSOK and the debut of OSOK Horde! 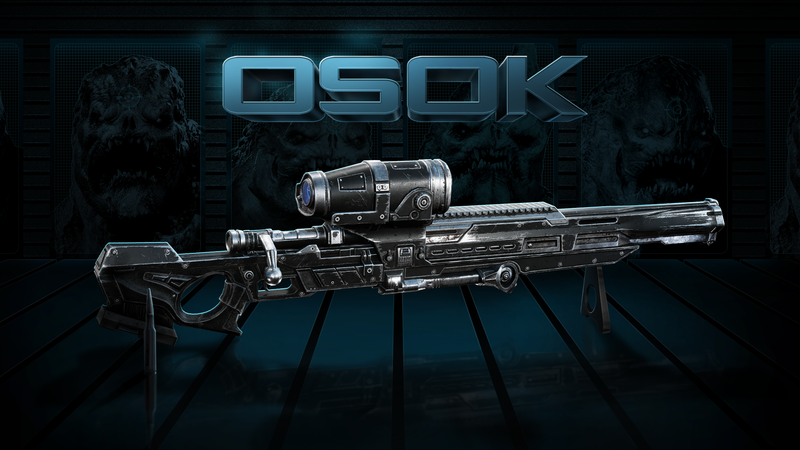 OSOK as classic as it comes – Longshots only, no melee, plenty of ammo and 50% bonus XP. Scopes up Gears, this is some pure Sniping heaven. We’ve been teasing this one for a while and we can’t wait to share it with you. The ultimate mashup of OSOK and Horde will finally take place in this brand new 25 Wave Horde Variant event. It’s time for OSOK Horde! Just like One Shot One Kill, OSOK Horde is all about those sweet sweet headshots. Every headshot you hit has a huge damage multiplier that will let you one hit kill almost any standard enemy as you progress through the waves! Double down with weapons like the Longshot, Marzka, Boltok, EMBAR and Torque Bow which all have increased damage in this playlist. All of that sweet headshot OP-ness comes at a price though. Fortifications have very little health, Power drop rates have been significantly reduced, damage for non precision capable weapons has been reduced and, most important of all, body shot damage is also significantly reduced. It’s all about those headshots or nothing at all. As with recent events like Stay Frosty for Versus, this will be an iterative mode for us that will be driven by feedback from the Horde community. Share your thoughts, likes and dislikes with us by tweeting @CoalitionGears or by posting in our official forums. We’ve going huge with our event challenges for this event – 4 different challenges (2 per OSOK mode) with a massive THIRTY weapon skins up for grabs. Yup, 3-0. OSOK: Look Ma, No Face. OSOK Horde: Can’t Stop This! OSOK and OSOK Horde will be sticking around for a whole two weeks until March 8th 2019! Every week offers up a huge 4XP bonus in one Ranked Playlist and this week is no different. Dive in to TDM right now to get your 4XP on followed by Dodgeball taking the spotlight on Monday. While most of the team’s focus is firmly set on Gears 5, we’re looking for ways to improve the Gears 4 experience. With the launch of Season 6, we introduced some behind-the- scenes matchmaking tweaks on a trial basis in King of the Hill. Bear with us, we’re about to get detailed! This launch was kept private for the initial 10 days in order for us to review the in-game data and monitor your feedback online to see the organic response, free of any potential influence that can sometimes occur when knowing about a change. We’re happy to report the changes are working as intended. Solo Players and smaller squads should now encounter 5 Player Squads much less often in Ranked Play. When matchmaking as a 5 Player Squad, you will now be matched against similar skilled and sized squads much more often, though you may need to wait longer – especially at the higher end of Skill Ratings to find suitable opponents. Every player has a behind-the-scenes Skill Rating that’s used to create an accurate measurement of your skill. When we matchmake, we use this to match you with as similarly skilled opponents as possible. When we form teams for a match, we use a combination of Skill Ratings to produce the closest matchup possible (ie. Team A has a Skill Rating of X, and Team B also has a combined Skill Rating of X is a perfect matchup). We also modify your Skill Rating evaluation based on the size of squad you are playing with, given the power of coordinated teamwork, so with more people in your Squad also ups your squad’s overall Skill Rating. We then use those Skill Ratings to predict your expected results. If Team A has a Skill Rating of X, but Team B has a Skill Rating of X+20%, then we would expect Team B to beat Team A in more rounds by a 20% margin (ie. every 10 rounds they play against each other, Team B is expected to win 7 while Team A is expected to win 3). The ideal to achieve a balanced match is to be as close to a 50/50 expectation as possible. Exceeding that expectation and winning lots of rounds shows your Skill Rating may be higher than where you currently are, and so it begins to move up. The reverse applies for losing when you are expected to win more than your opponents. The core of this change has introduced much stricter matches for 5 Player Squads compared to what we allow for Squads of 4 or less. As mentioned above, during the matchmaking process we evaluate and combine players to form a similar Skill Rating across both teams. However, with a 5 Player Squad, we are unable to make any changes to the teamformation to achieve a balanced game, and your Skill Rating is much higher as a combined squad. Previously, this meant we were seeing some notably imbalanced matchups of 5 Player Squads against standard combined teams of players because we matched from the individual’s Skill Rating, resulting in more unfair matches with high expectations to lose against 5 Player Squads than we’d like to see. What we’ve seen from our initial data and online dialogue is exactly what we expected. If you face a 5 Player Squad on a combined team, individually your team are likely higher INDIVIDUAL Skill Rated players than the 5 man by some margin, giving each team a more balanced chance to win/lose. As a High Skill 5 Player Squad, you will find more balanced meaningful matches that give you a chance to impact your Skill Rating. The good news is 5 Player Squads will now be matched much more evenly and should now have better quality Skill matches than ever. However, at the highest ends of the Skill range (ie. Diamond 1-5), finding fairer matches may become more difficult as the Skill banding used in matchmaking is more restrictive. Just like many other games with a Skill Rating system, such as League of Legends, wait times for full teams at the top of the Skill curve may significantly increase based on the number of available similarly skilled opponents looking to match at the same time. This is also then further limited by the current available population in your region within that playlist. The wait will be rewarded with quality opponents, but it may be longer than you are used to. If you really want to play more quickly, we recommend you split into smaller Squads in order to find a match. Now we had the necessary testing period to verify everything is working as intended with this change, we’ll be continuing to talk online about this change, look at our data and gather your feedback. We intended to roll this out in the near future to all other playlists – as always, you can leave your feedback in our official forum or tweet @CoalitionGears with your thoughts! Quitters have always been one of the biggest topics in Gears of War, and we hear your continued feedback loud and clear on wanting more action taken against quitters. While we have XP debt, Credit debt and ever-increasing time suspensions based on quit behavior, we want to continue to do all we can to dissuade quitting in Gears 4. Beginning on Monday, we’re doubling down on our penalties to deliver swift justice – fast. For those of you out there who complete all your matches and only drop from a match very rarely due to an unavoidable issue, you’ll be just fine. For those of you who decide to back out from a fair fight and quit, there will be an ever stronger barrage of penalties. For those who have been quitting rampantly, you may find your next suspension lasts several weeks or even months. We’ll continue to monitor the impact on match quit rates these new changes have and listen to your feedback. Quitters – you have been warned. In the wake of last week’s huge announcement, this week was relatively quiet in the world of Gears Esports. 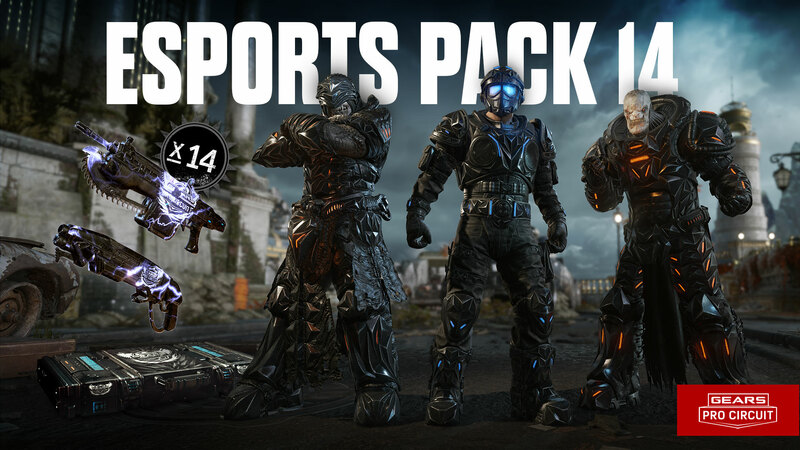 One thing worth noting, however, is that this week is your final opportunity to purchase Esports Supporter Pack 14! Don’t miss your chance to add the Black Steel variants of Sraak, Ben Carmine and Savage Theron, along with the Lightning Storm weapon set to your collection, as come Monday morning these characters will go into the vault. Looking for more information concerning the upcoming Gears Pro Circuit Boston Open? Make sure to tune into Gears Fight Nights each Wednesday at 3PM PT/6PM ET to stay up-to-date with the latest news, claim unique weapon skins, and enter to win other awesome prizes while watching some of the best teams go at it! Hi, my name is Itzell Barrientos, better known as EnemyKitty, I am 26 years old I am from the city of Monterrey Mexico, Twitch partner streamer. I started playing Gears 2 when I was 9 years old. But Gears of war 3 was my favorite, the mobility of the character, the actives on the Gnasher, the pilot mode amused me a lot, the best moments I lived in that game and I still have them but it was the beginning of my life stronger gaming. My Favorite character is Civilian Anya – she is empowered, beautiful and intelligent. I’ve been streaming for 5 years, it's my passion. I love interacting with my followers, playing and talking with them is the center of my inspiration - sharing the same tastes and experiences. To those people looking to get into streaming - never stop dreaming, do not be afraid – fans will discover your channel and be happy to support you. Just have fun to the fullest and stay positive that you will achieve everything you set out to do, be constant, and most importantly, always be attentive to your followers, they are the center of your inspiration. Being a TCA Partner is amazing. Gears of War is my favorite game, my dream was always to create content for the community of Gears of War, leaving a mark as a woman and to give an example that girls are also powerful. Hola, chicos, me llamo Itzell Barrientos, mejor conocida como EnemyKitty, tengo 26 años, soy de la ciudad de Monterrey, México, socio de Twitch. ¿Cuánto tiempo llevas jugando a Gears? Tengo 9 años jugando a gears, pero el primero fue gears 2, pasé mi tiempo alquilando gears 3 y el amor de este juego nació en mi corazón. Fue gracias a mis amigos que nos reunimos mucho para jugar Xbox. Antes de comprar mi propia consola. ¿Cuál es tu juego favorito de Gears y por qué? Gears of war 3 era mi favorito, la movilidad del personaje, los activos del gnasher, el modo piloto me divertían mucho, los mejores momentos que viví en ese juego y todavía los tengo, pero fue el comienzo de mi Juego, más fuerte de la vida. ¿Quién es tu personaje favorito de Gears? Anya Civil – empoderada, bella e inteligente mujer. Desde hace 5 años, es mi pasión. ¿Por qué se aplicó al programa TCA? Es mi juego favorito, mi sueño siempre fue crear contenido para la comunidad en gears of war, dejar una marca como mujer y dar un ejemplo de que las chicas también son poderosas. ¿Cuál es la cosa favorita que disfrutas del streaming? Interactuar con mis seguidores, jugar y hablar con ellos es el centro de mi inspiración, de tal manera en la que tienes afecto por la comunidad, compartiendo los mismos gustos y experiencias. ¿Qué aconsejarías a los jugadores que aspiran a convertirse en streamers? Nunca dejes de soñar, no tengas miedo que siempre abran personas para que te apoyen en tu camino, simplemente diviértete al máximo y mantente seguro de que lograrás todo lo que te propones hacer, ser constante y lo más importante, tus seguidores siempre se atentos a ellos ya que son el centro de tu inspiración. Check out some other great videos on her Twitch channel and give her a follow. You can also keep in touch with her on Twitter. Her Gamertag is IEnemyKitty. Goodbye 4XP Arms Race... 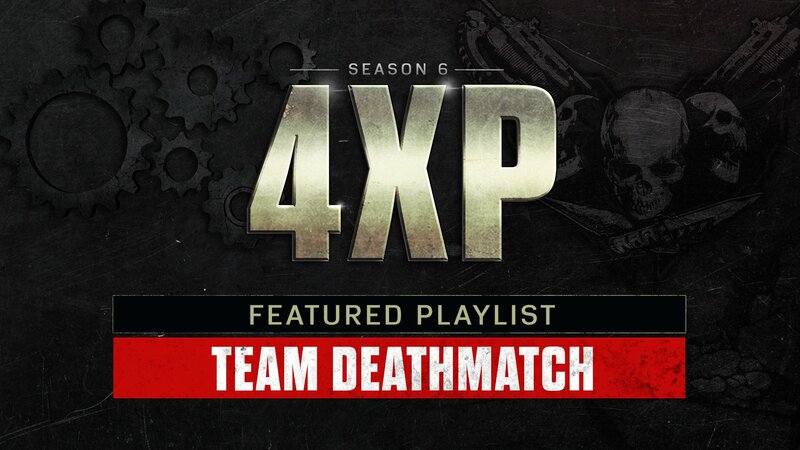 But a big HELLO to 4XP Team Deathmatch! Complete your Canadian Omen collection with the FREE Gnasher skin, play Gears 4 with us and a special guest, chat with fellow Gears fans, and get your questions answered.